Paris remains a beacon of culture and sophistication and a week spent promenading along the city’s quais and quaint streets was balm for the soul. Among the many familiar sights were the bouquinistes, those riverside booksellers whose forest green stalls have been a fixture by the Seine since at least the 18th century. The tradition of traveling bookselling in Paris goes back even further; known as “libraries forain,” wandering booksellers plied their trade as early as the 1550s when they were accused of distributing Protestant propaganda during the Wars of Religion. Open-air bookstalls were banned in 1649, and meandering booksellers were chased out of the city by Louis V during the 1720s. The ill-fated Louis XVI tolerated their return in the 1750s, and by the time Napoleon I took power, the bouquinistes had reestablished their territory along the riverbank, where they’ve remained a fixture ever since. Today, bouquinistes must follow regulations regarding stall size and pay an annual fee to sell books, and, until recently, business has been brisk; collectively, over 240 bouquinistes cram 300,000 books into 900 stalls along nearly two miles of Seine waterfront, creating the largest open-air bookstore in the world. UNESCO even named the Seine riverbank a world heritage site in 2011. Yet, the bouquinistes as we know them are in danger of turning into little more than trinket shops with matching roofs. According to an article published this summer by La Depeche, bouquinistes are increasingly feeling the pressure to sell cheap souvenirs rather than rare books. “We can’t count on books anymore,” said one bookseller in the article, whose stall overflowed with keychains, bottle openers, and postcards. Bouquinistes aren’t prohibited from selling trinkets; current regulations permit one out of every four stalls to sell items other than books. Indeed, many of the stalls on my recent visit overflowed with plastic curios, while books were hidden from sight. Some sellers feel this is a bad omen, that souvenir sellers are diminishing the long and storied history associated with the trade. “We are calling on those who love Paris across the globe, those who love to stroll along the Seine, who want to preserve this unique cultural patrimony which we hold dear,” said David Noesk, a bouquiniste who recently started a Change.org petition aimed at doubling down on souvenir peddlers. “These souvenir merchants distort the objective which is at the very origin of our creation and the charm of our Parisian quays,” Noesk wrote on the petition website. So far, 12,000 people have signed the petition, 3,000 shy of the 15,000 goal, at which time the petition will be delivered to the mayor of Paris, Anne Hildago. Stay tuned for what happens next to the booksellers of the Seine. 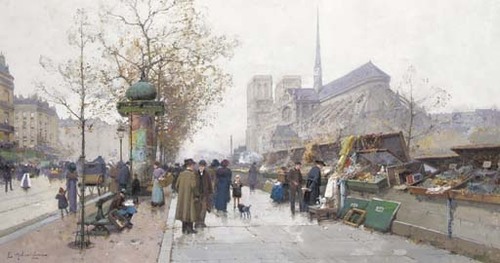 Photo credit: Paris, Bouquinistes sur le quai de Tournelle, by E. Galien Laloue. Public Domain. Paris remains a beacon of culture and sophistication and a week spent promenading along the city's quais and quaint streets was balm for the soul. Among the many familiar sights were the bouquinistes, those riverside booksellers whose forest green stalls have been a fixture by the Seine since at least the 18th century. The tradition of traveling bookselling in Paris goes back even further; known as "libraries forain," wandering booksellers plied their trade as early as the 1550s when they were accused of distributing Protestant propaganda during the Wars of Religion. Open-air bookstalls were banned in 1649, and meandering booksellers were chased out of the city by Louis V during the 1720s. The ill-fated Louis XVI tolerated their return in the 1750s, and by the time Napoleon I took power, the bouquinistes had reestablished their territory along the riverbank, where they've remained a fixture ever since. Yet, the bouquinistes as we know them are in danger of turning into little more than trinket shops with matching roofs. According to an article published this summer by La Depeche, bouquinistes are increasingly feeling the pressure to sell cheap souvenirs rather than rare books. "We can't count on books anymore," said one bookseller in the article, whose stall overflowed with keychains, bottle openers, and postcards. Bouquinistes aren't prohibited from selling trinkets; current regulations permit one out of every four stalls to sell items other than books. Indeed, many of the stalls on my recent visit overflowed with plastic curios, while books were hidden from sight. "We are calling on those who love Paris across the globe, those who love to stroll along the Seine, who want to preserve this unique cultural patrimony which we hold dear," said David Noesk, a bouquiniste who recently started a Change.org petition aimed at doubling down on souvenir peddlers. "These souvenir merchants distort the objective which is at the very origin of our creation and the charm of our Parisian quays," Noesk wrote on the petition website. So far, 12,000 people have signed the petition, 3,000 shy of the 15,000 goal, at which time the petition will be delivered to the mayor of Paris, Anne Hildago. Stay tuned for what happens next to the booksellers of the Seine.